Do You Know the Epidural* Rate in Your State? Remarkably, researchers found a wide variation in the use of neuraxial analgesia from a low of 35% for vaginal births in Maine to a high of 79% for vaginal births in Nevada. They observed no clear “dose-response” association between the number of anesthesiologists or the number of CRNAs per 1000 births with neuraxial analgesia. Intrapartum factors most closely associated with neuraxial analgesia were labor augmentation and labor induction. Socioeconomic factors that were associated with a lower use of neuraxial analgesia were older maternal age, nonwhite race, Hispanic ethnicity, no private insurance or no insurance, twelfth grade or less education, and late or no prenatal care. Women whose birth attendant was a midwife or “other” were less likely to use neuraxial analgesia that women whose birth attendant was a physician. The researchers suggested that unmeasured patient-level and hospital-level factors likely explain a large portion of the variation across U.S. states. They speculate the patient-level factors may include lower health literacy, cultural and religious factors, antenatal participation in childbirth classes, and patient preference. Unfortunately, the study conclusions raise the question, “Do pregnant women with little or no insurance and little or no prenatal care may have less access to neuraxial analgesia?” As a childbirth educator, I am especially interested in the effect of childbirth education on the preference and actual use of neuraxial analgesia. 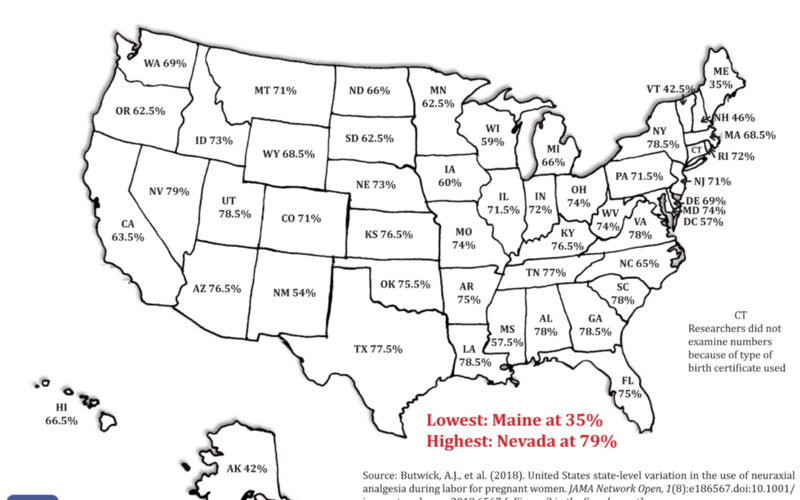 Look at this map to see the percentage of women in your state who use neuraxial analgesia for vaginal births. *Neuraxial anesthesia/analgesia techniques include epidural, spinal, and combined epidural-spinal. Why Puerto Rico is not included?